The website builder tools enable users to create attractive website without coding and testing individuals. A user also has option to choose from a wide range of website builder tools. Both WordPress and Wix are widely used website builder tools. WordPress is currently the most popular content management system (CMS), here are some interesting WordPress numbers whereas Wix is a widely used cloud-based web development platform. WordPress enables developers to build websites without writing additional code by providing various themes and plug-ins. Wix also enables developers to add functionality to the website without writing additional code by using specific applications. However, the users must understand the major differences between Wix vs WordPress to pick the right website builder tool. Both Wix and WordPress enable users to build website without being proficient in various web technologies. The drag-and-drop interface provided by Wix helps users to build websites simply by selecting the specific element. The users can further take advantage of the WYSIWYG interface provided by Wix to make changes to the elements. They can even use the interface to write content, add media content, and rearrange website elements without putting extra time and effort. Unlike Wix, WordPress does not provide a drag-and-drop interface. Instead, it provides a visual editor that users can avail to write content and customize themes. The users also have option to use the WYSIWYG interface provided by WordPress to change the theme properties. Often beginners have to invest extra time and effort to learn how to use the visual post editor, customizer, and menus provided by the CMS. Both Wix and WordPress enable users to build appealing websites without putting extra time and effort. While using Wix, developers have option to choose from over 500 templates belonging to different categories – ecommerce, business, personal, hobbies and art and craft. . These pre-made templates are written in HTML5, while being fully responsive. Wix also allows developers to modify and customize these pre-made templates through built-in tools. But it does not allow users to switch from one template to another. WordPress allows users to choose from over 4000 free and paid themes. Unlike free themes, paid themes provide additional features and premium support. But both free and paid themes go through an elaborate and strict review process. WordPress developers can further modify and customize the themes by availing the built-in customization options or creating child-themes. They can even switch from one WordPress theme to another without any hassle or restriction. Each of the two website builder tools enables users to add functionality to the website without writing complex code. WordPress allows users to add functionality to the website through plug-ins. The users have option to choose from thousands of free and paid WordPress plug-ins according to their precise needs. In addition to choosing from over 38000 free plug-ins, they can also choose from a wide range of plug-ins available on external marketplaces. A user can further use plug-ins to add both simple and complex functionality to the website without putting extra time and effort. On the other hand, Wix enables users to add functionality to the website through apps. While using Wix, developers have option to choose from over 500 apps according to their specific needs. These apps help developers to add both simple and complex functionality to the website almost immediately. However, quality and price of individual Wix app differs. Normally, the free or lightweight version of an app lacks some of the advanced features provided by its premium counterpart. Wix is designed as a self-contained website building tool. While building websites, developers can use Wix both as the operating system and the web server. They even have option to use either custom domain names or sub-domain names. A user can further use Wix to build Wix without having web development skills. But Wix does not allow users to control their website fully. The users lack option to switch from one template to another. Likewise, they cannot add new functionality to the website without getting approval. As an open source CMS, WordPress is much more flexible than Wix. In addition to reducing website development cost, WordPress also allows users to customize and manage the websites without any restrictions. The users can change the design and layout the website by switching from one theme to another. Likewise, they can add functionality to the website simply by adding specific WordPress plug-ins. However, the user must be proficient in various web technologies to make changes to the source code of WordPress. WordPress is designed as a content management system. It does not provide any built-in features for eCommerce application development. But many developers prefer creating eCommerce website with WordPress WooCommerce. In addition to being a free plug-in, WooCommerce can also be integrated seamlessly with both existing and new WordPress websites. WooCommerce enables users to convert WordPress websites into web stores that sell both digital and physical goods. 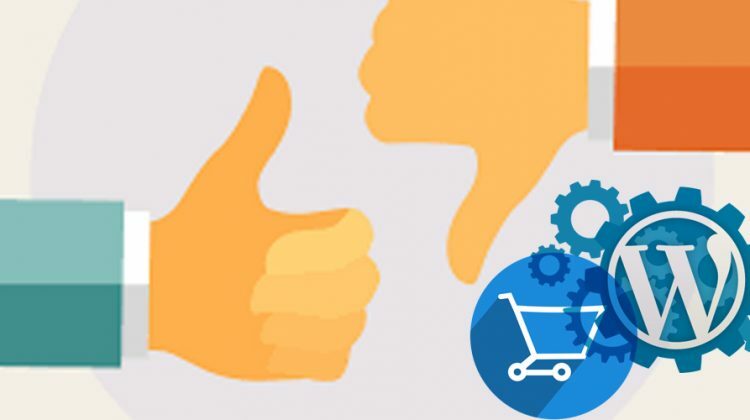 Interested readers can find out more about pros and cons of using WordPress for eCommerce. Wix allows developers to build eCommerce by subscribing to the eCommerce premium plan. In addition to 20 GB storage space and unlimited bandwidth, Wix also enables users to display various products and product categories on each page. It even provides options for managing products, and setting up payment, shipping, and taxes. A user can use Wix as an eCommerce website builder simply by upgrading from basic plan to eCommerce plan. WordPress is an open source content management systems. Hence, the developers can use the CMS without paying any licensing fees. They can further curtail overall web development cost by using free themes and plug-ins. However, the users have to incur additional expenses to avail paid themes and plug-ins. Also, they have to book a website domain and avail website hosting services to launch the WordPress website. On the other hand, Wix allows users to choose from basic and premium plans – connect domain, unlimited, ecommerce and combo. A user can reduce web development cost by opting for the basic plan – connect domain. But he will lack the option to use robust add-ons like ecommerce and Google Analytics. Also, the plan will add Wix-branded ads on top and bottom of web pages. The user has to upgrade from basic plan to premium plans to avail additional storage space, bandwidth, and add-ons. On the whole, both Wix and WordPress enable users to build websites without coding web pages. But WordPress is a content management system, whereas Wix is a cloud-based web development platform. Each of these two website builder tools also has its pros and cons. Hence, users must keep in mind the precise needs of each web development project while comparing Wix vs WordPress.